In July, teachers from three Sarasota Sister Cities traveled to the United States to take part in Florida Studio Theatre’s Write-A-Play Teacher Training, thanks to the Sister Cities Association of Sarasota. During their visit, they received a tour of Sarasota sites including the Ringling Museum, the University South Florida Sarasota-Manatee, Ringling College of Art & Design and Mote Marine Aquarium. 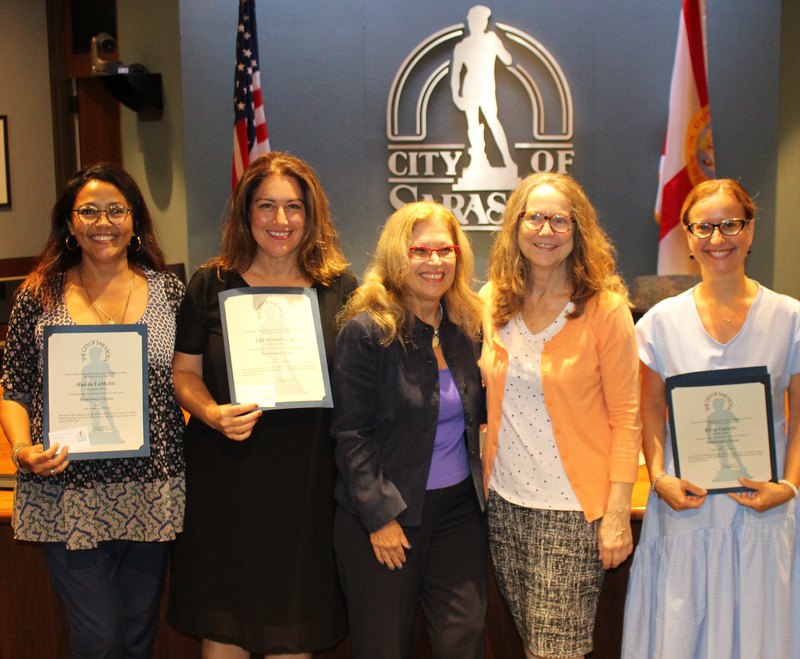 They also received Honorary Sarasota Citizen Certificates from Mayor Liz Alpert at City Hall. The Write-A-Play contest is an annual event where high school and elementary school students submit short plays, which are judged by experts, and the winning plays are acted out by professional actors. Sarasota Sister Cities invites students from their Sister Cities to submit to the contest, and winners come to Sarasota to see their plays on stage. Since 2000 when the international program started, nearly 100 students have seen their plays performed at Florida Studio Theatre during the Young Playwrights Festival each year. In the past, teachers from Florida Studio Theatre (FST) would go to Sarasota’s Sister Cities to train teachers. These teachers would then educate their students on the playwriting process and encourage them to submit their plays to the Write-A-Play contest. This is the first time teachers from Sarasota’s Sister Cities came to Sarasota to receive their training at FST. The one-day training on the playwriting process was led by Adam Ratner and Caroline Kaiser—who manage, coordinate, and participate in selecting the winning plays. This year, stories submitted from Sarasota’s Sister Cities of Dunfermline, Scotland; Treviso, Italy; Vladimir, Russia; and Tel Mond, Israel won in the Seven Up category, which includes student submissions from grade 7 through 12. The winning play’s topics range from the experience of taking in foster children to dealing with depression and anxiety. Learn more about Sister Cities Association of Sarasota on their website, or contact Toni Duval for more information on the Write-A-Play delegation visit. No Replies to "Sister Cities Association of Sarasota Exchange Will Help Students Learn Playwriting"